Here you are in Salice, Montaretto’s hamlet, Bonassola city. Our house is exactly at the crossing of the path between Bonassola and Framura and the road coming from Montaretto; it is the last house before going into the woods. The site is ideal for those who want to spend a holiday away from all, surronded by nature especially for those who love hiking. In fact the path beside the house, the “Verde – Azzurro” (marked SVA on the map), covers all the Ligurian coast from Ventimiglia to Portovenere, passing through the “Cinque Terre”. Moreover in the Bonassola Rail Station there are trains that stop every hour destinated for the “Cinque Terre”, which are only 10 minutes far away. 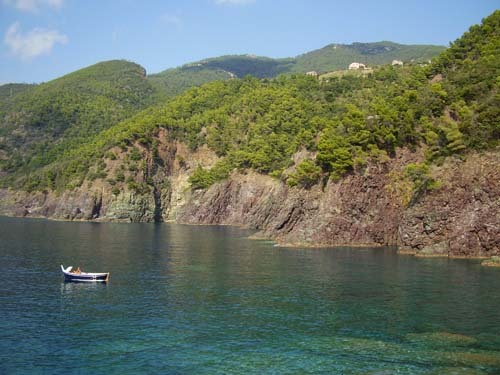 To enjoy the sea life-style you can reach nice coves and very quite cliffs in 30/40 minutes walking on the path; you can also go to the beautiful Bonassola beach (30 minutes walking or 9 km by car) or drive 9 Km to the more lively Levanto. Noteworthy are the inland walks; Varese Ligure is half hour away by car and just a little bit further the Penna and Maggiorasca mountains with their natural reserve. From here, some of the best known art cities are easily accessible by car or by train: Genova, Pisa and Lucca are just over an hour away and Firenze or Parma about two hours. If you would rather just kick back and relax, you can spend the day in the peaceful terrace and garden; in front of you nothing else but the sea.